Okay, okay, I’m not being serious. I don’t want you to actually go out and put real chicken poop on your lips; I just want you to go out and buy Chicken Poop, the lip junk aka lip balm. I was in the checkout line at a local drugstore when I saw a box labeled Chicken Poop. Of course, my initial reaction was “WTF? !” But, that also made me pick up the actual product and look at it, which is the whole reason behind naming it something so… different; they want you to stop what you’re doing and pick up the product. 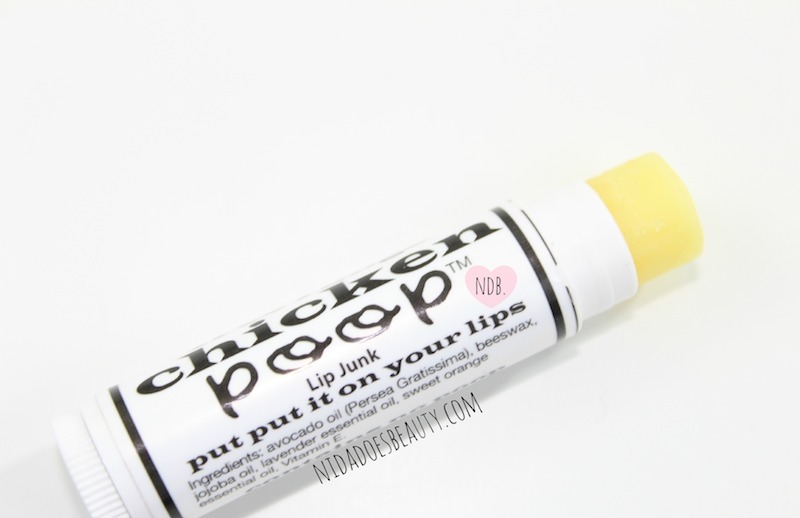 Chicken Poop Lip Junk for your lips! As expressed in my recent nighttime skincare routine post, I like to use skincare products that are more natural since I slather my face with makeup products that aren’t necessarily great for my skin. I was really excited when I saw that this lip balm contained natural, beneficial ingredients, and no added chemicals, which is an immediate turn off for me. The Good| Chicken Poop (I laugh every time) contains avocado oil, beeswax, jojoba oil, lavender essential oil, sweet orange essential oil, and Vitamin E, making this lip balm very moisturizing and pleasantly fragrant. I tend to have naturally dry lips so I am extremely picky about which lip balms I apply on my lips, and that means I buy a lot of lip balm, but rarely fall in love with any. I’ve tried Carmex, Burt’s Bees, Soft Lips, Blistex, and good ol Chapstick, but nothing has ever worked as nicely as this. Also, this is all natural with great ingredients so that is a definite plus! Although I do like the Fresh Sugar Lip Treatment, it is extremely expensive so I don’t like to use it all the time or carry it in my purse– I generally only use that at night. Plus, it does have some added chemicals that aren’t prevalent in Chicken Poop. 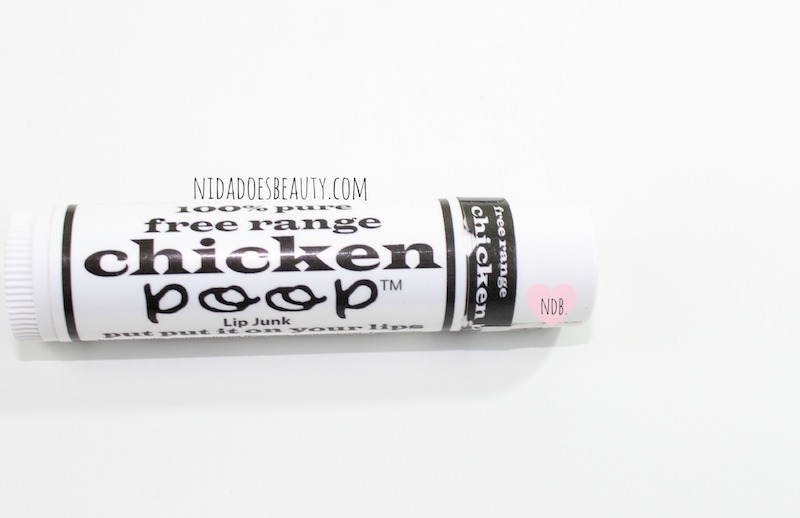 So, Chicken Poop is the perfect alternative because it is inexpensive, and that means I can throw it in my bag, which tends to devour any and all lip products I put in there. I’m the absolute worst at keeping track of my lip balms so if I were to lose this one, it wouldn’t be as big of a deal as if I were to lose my Fresh lip treatment, which costs about $22– yikes! The Bad| There really is no downside to this lip balm! The only thing that could be an issue is the availability since it isn’t such a mainstream brand. Luckily, they carry this at my local drugstore, but if they don’t sell this near you, check online! Chicken Poop contains natural ingredients and doesn’t actually contain any poop! The Verdict| I deem this lip balm a must have! It is inexpensive (around $2- $3) and contains great ingredients. Who doesn’t want that?! Before you visit your local drugstore or high end makeup counter try this product out because I’m sure you will love it more than those other mainstream brands! Would you put Chicken Poop on your lips? Let me know in the comments!